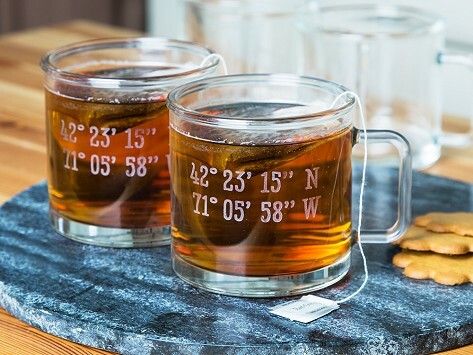 Each 12-ounce camp mug in this set of either two or four is distinctively sand etched with the Latitude and Longitude coordinates of your choosing. 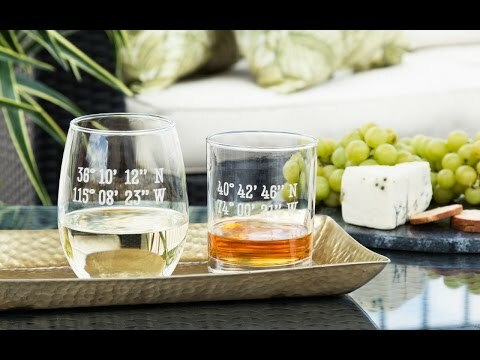 Each glass is individually hand cut in a 100+ year old factory. Fluid Capacity: 12 fl. oz. Dimensions: 3.25" D x 3.75"
Fine quality. Excellent, useful keepsakes. When I take one with me to AL Post 81 or other places, they ask e what the numbers stand for. Then I tell them that they are to longitude andde and latitude coordinates of my street address. I tell them where I got them from. When my wife and I got married it was important to me to get married at our house - which was my grandparent's house and thus the center of our family. We had a beautiful ceremony in the large backyard surrounded by friends and family. The bittersweet part was that we both knew we'd be moving in a few months. That was the house I'd grown up in and the place she found a new home but it was time to downsize.